One month into my freshman year of college at the University of Florida, I lost my feeling of invincibility. After weeks of looking for an answer to my worsening symptoms like night sweats, extreme itchiness and rapid weight loss, I finally had one – Stage IV Hodgkin’s Lymphoma. My doctor promptly reassured me that this mostly curable cancer was just a ‘bump on the road’ to better and brighter things. Fate had a different path in store for me. Five years later, after 63 nights in the hospital, over 600 hours of chemotherapy, two bone marrow transplants, 18 days of radiation, and enough relapses to stop counting, my journey with cancer goes on. More importantly, my life as a soon-to-be University of Florida graduate with a 4.0 GPA goes on – and that’s definitely something worth fighting for. The hardest part about living with cancer is trying to plan for your future. With so many unknowns, I’ve learned to live for each day and savor every moment. Despite this, as a young person trying to find my place in the world, it seemed impossible to avoid thinking about my future. I often questioned, ‘why continue to work towards a college degree when I may never see it to completion?’ Yet, I ultimately found that just as I couldn’t give up on my health, I couldn’t give up on my future. That isn’t to say there weren’t obstacles. Many advisors, professors, and people close to me encouraged me to drop courses or give up on entire semesters in order to focus on my health. Nonetheless, I persevered and managed to earn a 4.0 GPA from the College of Business and graduate only a year behind my peers. The one thing most people forget to mention about being diagnosed with cancer is the positive outcomes. At 23, after 5 years of battling cancer I am thankful and proud to have married my soul mate, started the Live For Today Foundation to help other young adults with cancer and now be able to fulfill my lifelong dream of graduating from college with high honors. None of these accomplishments would have happened without my unique perspective on life in the face of death, the support of my family and friends, and all of the Gator Nation cheering me on. Hi Todd, My name is Gina Metzger, and your story hit close to home for me. My husband Chris went through a battle with Hodgkins, starting in August of 2003. I remember the doctors saying, if you have to have cancer, this is the one to have. He had a bad reaction to his first chemo, which caused his whole protocol of treatment to get changed. He did have a bit of remission in April of 2004, but lost his battle in October of 2004. He was 48. It is wonderful that you started this foundation for young adults going through cancer. I am amazed at your accomplishments throughout your battle. Everyday researchers out there are making strides in finally finding cures for this. Please keep up the great work you are doing. And you will be in my prayers. I truly hope that some day we won’t have to be doing these things, because cancer will be gone. I saw you and your beautiful wife on the Today Show this morning. I am truly inspired by your outlook on life in the face of death. I was brought to tears listening to your testimony, as I have a similar experience. My fiance and I found out he had a rare form of cancer a year into our dating. I knew I would be there for him through everything. Cancer took a toll on our lives as we battled through each day. Many days were so great, we would forget cancer was even part of our lives. As you know, life is a rollercoaster of ups and downs. He battled cancer for 18 months and on December 11, 2011 he went to be with Jesus. He was 32 years old. He was saved a week before his journey ended. It was such an honor to be by his side. I saw you and your lovely wife on TV this morning and you looked just like my son Grady when he was going through his treatments. He was 22, had just graduated from Indiana University and ready to go to Florida State as a graduate assistant when his world stopped. 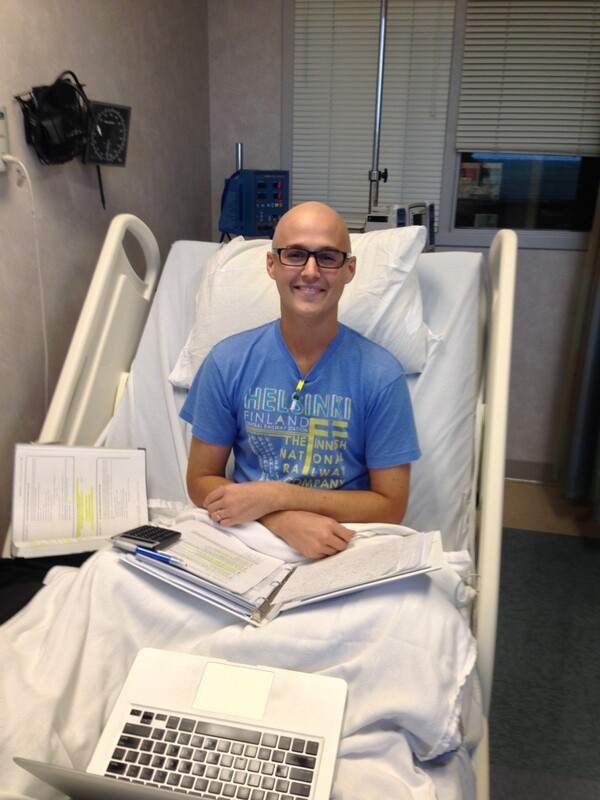 He was diagnosed with Stage IV testicular cancer that had spread to liver, lung, lymph node. After a year of treatment, including a clinical trial and stem cell transplant, I am happy to say he is alive and well. He also married his high school sweetheart and she has been at his side for eleven years now as his wife. He is 35, finished his masters and doctorate, teaches college, continues to have regular checkups and is healthy. I wish the same for you. I too was diagnosed with Hodgkins when I was 19, stage 3B. That was 40 years ago. Hang in there, there is hope. My husband was also diagnosed with Hodgkin’s Lymphoma at 18 – stage 4B. Ten relapses later (I am not exaggerating) and one diagnosis of lung cancer (due to all the treatments) he is still around, aged 43 and father to two beautiful cchildren. Just keep swimming!